World Champion Barrel Racer and Olympic Gold Medalist Kappy Allen put together this video clinic. The video demonstrates proper hand position and how it contributes to a happy, relaxed and focused horse with bend through the body. All these key factors result in a smooth run and FAST TIMES. Kappy says “relaxed and fluid means consistent and fast”. The key to this is hand position and this all starts in the practice pen. We need to train our muscle memory so that in the run and at fast speeds we are in the proper position without having to think it through. “Relaxation means bending through the entire body”. We want our horses to bend through the ribcage and remain relaxed while doing it. Proper hand position will contribute to this. Kappy states that a horse that runs tight and tense is more likely to run choppy and take extra steps. A tense horse is also more likely to hit a barrel. To avoid this she feels we need to always be paying attention to where our hands are in the practice pen always working for a relaxed horse. This starts at a walk. 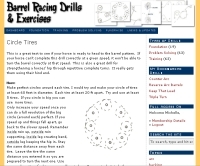 Watch this great video with barrel racing tips to learn how to achieve this. At the end of the video Kappy talks about different barrel racing bits and their uses. I enjoyed the video very much. Are you going to have any clinics in Kansas City, MO. I have a six year old horse that I’ve been training for three years. I can not get him to stop bucking from one barrel to another. I have had the vet look at him and he said he is sound. Maybe he doesn’t like his saddle? Maybe he doesn’t like how you are asking him to go fast? Maybe he doesn’t like barrel racing. You’ll have to check Kappy’s website for her schedule.